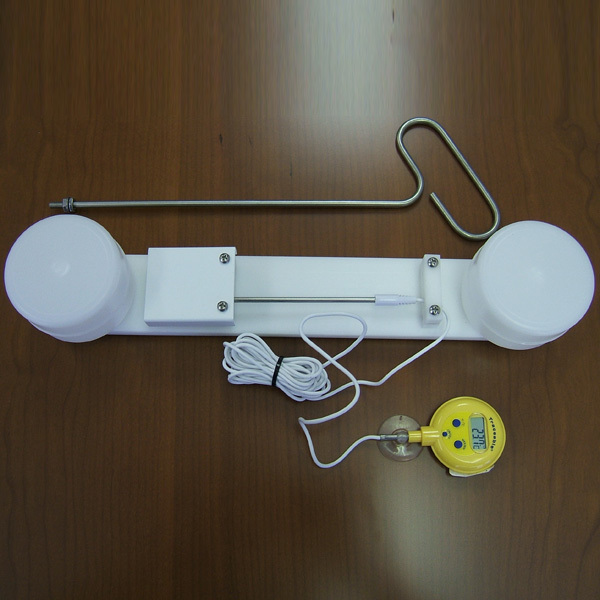 The 255-212 Min-Max Thermometer can be configured as either a floating or submersible thermometer for measuring the minimum and maximum temperatures of water, such as in an evaporation pan. It features a digital thermometer mounted on a non-magnetic base. 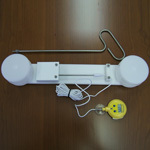 The built-in solar radiation shield protects the thermometer against direct sunlight. In a float-mounted installation, two floats are installed on the thermometer base to float the thermometer approximately 1/4" below the water surface. The thermometer is then attached to an anchor using flexible lines at least 10" long, but short enough to keep the unit approximately one foot from the edge of the pan and the gauge. 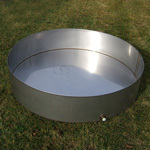 In a submerged installation, the thermometer base rests on the bottom of the pan. A non-magnetic handle is fastened to the base and hooked over the edge of the pan. The thermometer should be located on the inside-bottom of the south side of the pan (in the northern hemisphere) to ensure that the thermometer is shaded as much as possible from the direct rays of the sun. Stainless steel probe diameter 0.14", length 5"
Case diameter 1-3/4", depth 1/2"